This is, obviously, their best gel, that's the one you publish. The insulin resistance (fainter P-Akt band) when insulin and Se are both used compared to insulin w/o Se exposure does appear to be there. 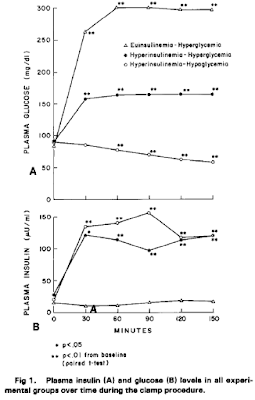 At physiological levels of insulin this differential seems likely to be maintained. 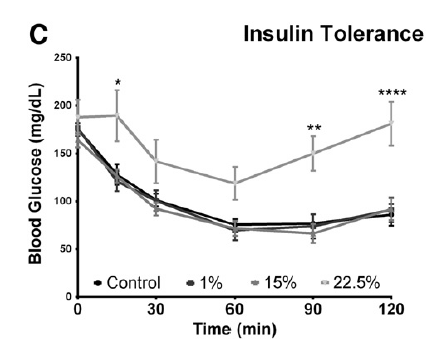 Control is from cells under RPMI 1640 alone, traditionally 11mmol/l glucose. 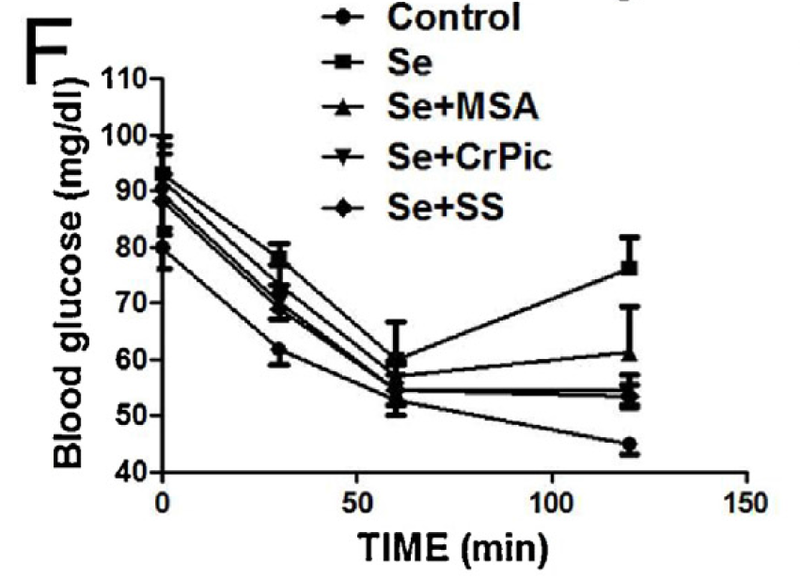 Excess selenium blunts insulin signalling so allows FFA release from intracellular triglyceride stores, so increases ROS (in the same way as metformin does but w/o the suppression of gluconeogenesis intrinsic to metformin's action). Adding rotenone, as you would expect, blocks RET so blocks ROS generation. CCCP uncouples respiration, drops delta psi so blocks RET/ROS. Etomoxir blocks access of FFAs to mitochondria so blocks input at mtETFdh, so blocks RET/ROS. MitoQ powerfully targets all mitochondrial ROS so over-rides the FFA oxidation ROS generation effect. 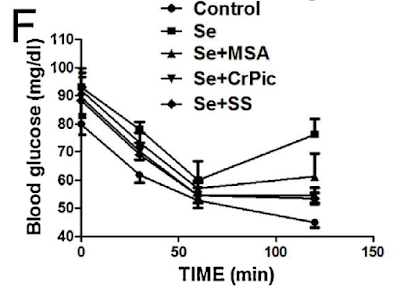 Chromium picolinate restores insulin signalling by repleting the Cr depletion induced by Se. MSA is an inhibitor of glutathione peroxidase, so it eliminates the effects of excess GPX. 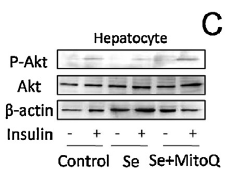 And SS, sodium salicylate, appears to block intracellular lipolysis in hepatocytes, so suppresses fatty acid supply to mitochondria, much as insulin or etomoxir would. All a very plausible narrative. I'm not very comfortable with oligomycin as a suppressor of FFA oxidation induced ROS. It is another, rather serious, blight on the paper. It certainly should have been discussed. I would usually ignore the whole paper except Tom Naughton gave us all the heads up on a recent report of a chap taking what might have been a hefty dose of green tea extract who went in to liver failure. Obviously most folks just excrete antioxidants like GTE with little harm done. I just wonder if he got unlucky or took a huge dose while walking round with the sort of liver full of lipid so beloved of Public Health England. Losing the protection of insulin's inhibition of lipolysis simply dumped a ton of unregulated intra-hepatocyte FFAs from lipid droplets on to his mitochondria, which then popped their clogs. Labels: Green Tea Extract; superb antioxidant? A destruction of Paleo Diet™ as a management tool for metabolic syndrome in modern humans surfaced recently in a tweet from Miki Ben-Dor, along with his comment that he views meat as the default paleo food. Plants used as "food" come and go and are nowadays developed in to reduced toxicity versions which are what we call vegetables. Meat is meat and even the invention of factory farming does not seem to be able to convert it in to anything as toxic as a courgette. Remember this? Anyway, back to the Pacific Islanders. This is the book chapter we're interested in and it's entertaining. These people appear to have read (and cite) essentially every paper on gout in archeological record of the paleo Pacific Islander population. They are using gout as a skeletally preserved marker for metabolic syndrome, a fairly reasonable approach to my mind. The assumption that meat causes gout (lots of purines don'tchano) which is threaded throughout the chapter is less acceptable. "We have also used a case study of Pacific Islanders’ experiences with MetS and paleopathology evidence of gout to reexamine the very basis for the “necessity” of a return to a Paleo Diet. As discussed, the ancestral diet (based on tuberous root crops, not cereals) and population history of Pacific islanders are completely different to the Old and New Worlds where the Paleo Diet debate is entrenched. Yet the burden of MetS is extremely high in the Pacific. While the adoption of westernized diets has exacerbated the expression of MetS conditions in modern Polynesians, the paleopathological evidence (especially gout) suggests the origins of these conditions stems from their Lapita ancestors, who in turn trace their roots back to Island Southeast Asia". Gout was widespread in the pre-Westernisation Pacific Islanders, despite their paleo diet. The core quote re this paleo diet is that it is "based on tuberous root crops, not cereals". Translation: A Paleo Diet diet based on paleo tuberous root crops gives you paleo gout. Eat some meat and get your calories from fat. Vegetables can be viewed as a recreational indulgence if you so wish. But maybe don't over do them unless you want Paleo Diet™ gout. Labels: Stone Agers in the Fast Lane? 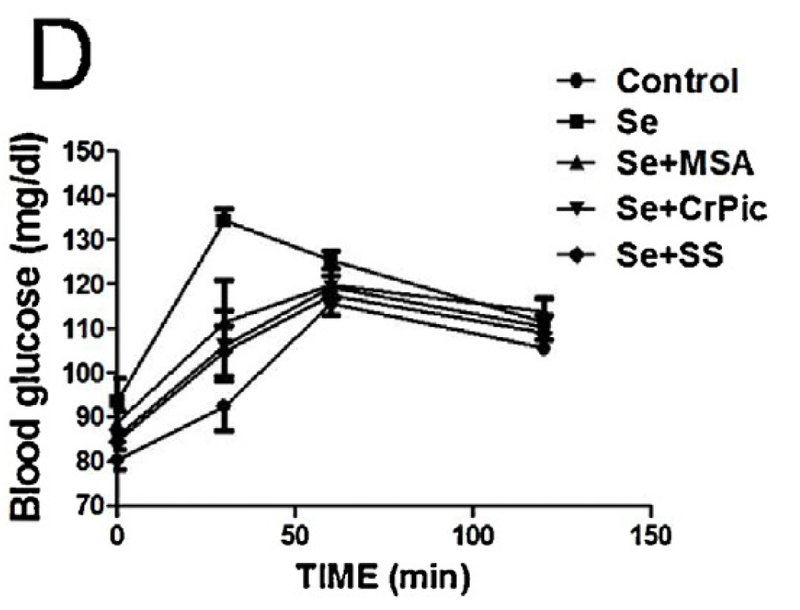 TLDR: excess selenium induces excess glutathione peroxidase which blunts physiological superoxide/H2O2 signalling within a cell. This, as you might expect, is a Bad Thing. I stumbled across this paper quite by accident. It has a number of problems, not least of which is that none of the authors appears to be a native english speaker and this tends to show through. It also carries a rather catastrophic typo/brain fart in the abstract, where TCA, as in tricarboxylic acid cycle, was written out in full as trichloroacetic acid cycle. Ouch. Never the less, they don't seem to like antioxidants. 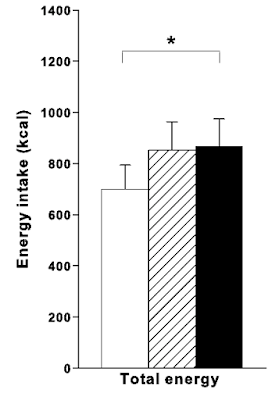 Over all they don't seem to like suppressing the physiological levels of ROS needed for insulin signalling, certainly while feeding their rats a high carbohydrate diet. Not that they tell us what they fed the rats on! Among many of the problems with the paper another is the difficulty distinguishing which line is which on the graphs. I think we can say the top line is clearly the selenium supplemented group and the bottom line is probably the control group. The main effect is at the 30 minute mark. This suggests to me that there is an inadequate first phase insulin response (needing ROS from RET induced by mtG3Pdh) to overcome the systemic failure of insulin action (also needing ROS from RET via mtG3Pdh to diffuse as far as the insulin receptor). By 60 minutes the difference is negligible. 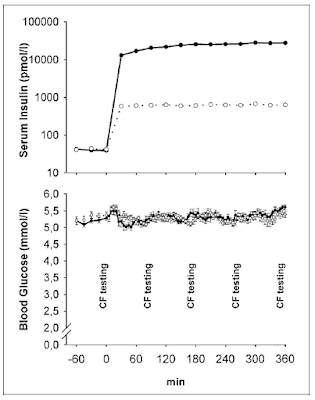 Had they measured insulin I'd bet the second phase response was exaggerated. This time the bottom line is clearly the control group, top line the selenium treated group. 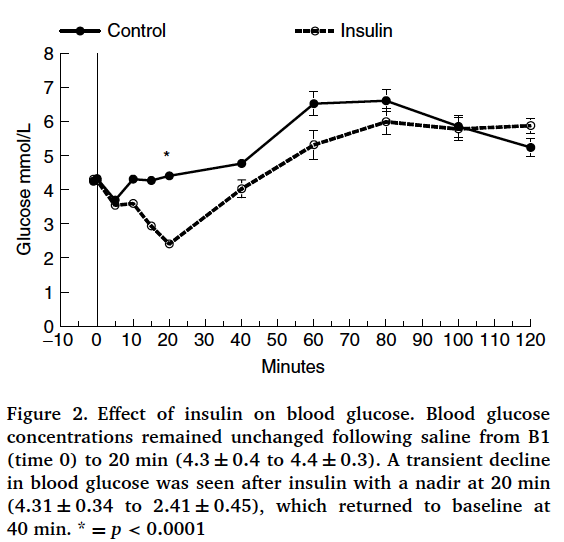 From the control group I see no suggestion that this particular dose of insulin is inducing insulin-induced insulin resistance, so all we see is the failure of the insulin signalling activating action of ROS at the two hour mark. Note the lines are all parallel until the one hour mark. 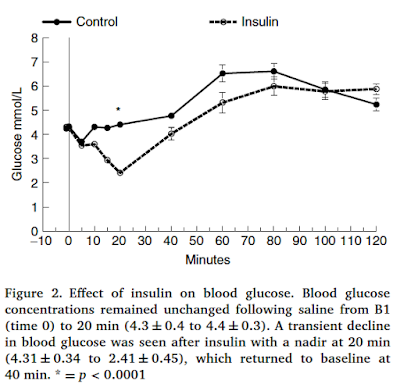 This is what suggests that there is nothing wrong with insulin action per se at the 30 minute mark and is another factor which makes me suspect that there is a failure to secrete insulin during the early stages of the IPGTT. 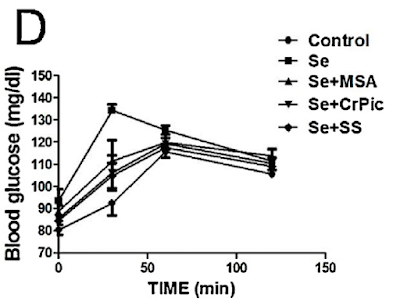 The normal response to exogenous insulin, up until one hour mark, occurs while ever the exogenous insulin can overcome the loss of ROS caused by the glutathione peroxidase excess induced by the high selenium diet. As humans we deal with huge numbers of xenobiotic antioxidants, mostly from plants. For the vast majority we can simply use our liver and/or kidneys to dump them to where they can do us no harm. 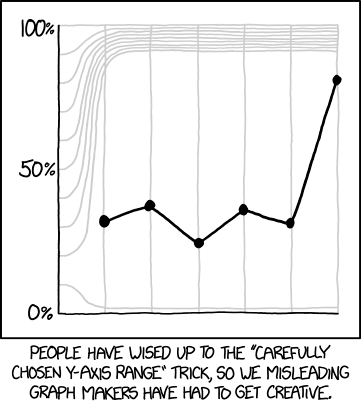 Just occasionally we fail, as with selenium. The end result is not pretty. There are some more interesting finings in the paper which might be worth chatting about. Maybe another day. Random throw-away thought: Is this how uric acid induces insulin resistance? By being too good an antioxidant???? Hmmmmmm. This is another very abstracted study using isolated mouse islets in cell culture to assess the effect of metformin on insulin secretion. From the Protons perspective the factors which drive insulin signalling are the same ones which drive insulin secretion, certainly at low physiological concentrations. The situation is different under post prandial conditions where, eventually, reverse electron transport increases from low, physiological activating levels of ROS to the high physiological levels which drive insulin resistance rather than activation. Recall this is what I consider to be the cellular repletion signal, the one so easily mistaken for insulin as an anorexic agent. 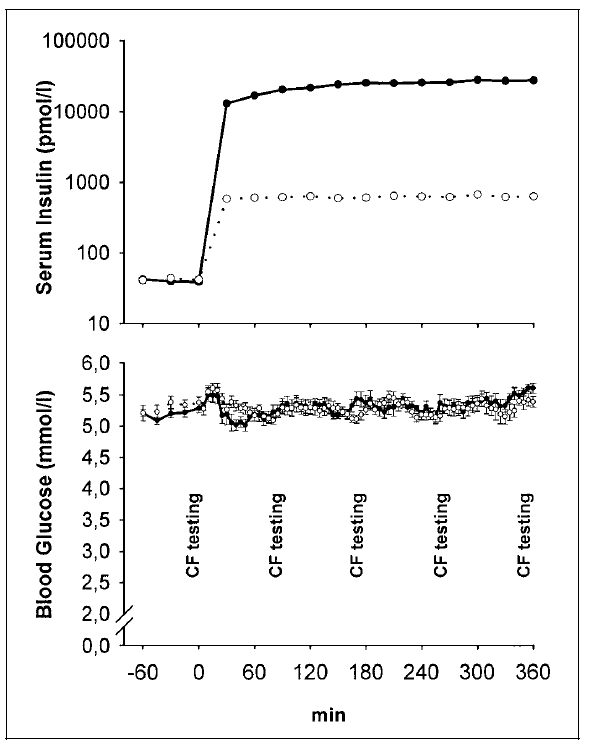 Anyway, here we have metformin acting under 11mmol/l of glucose to suppress insulin secretion. Any findings in the paper using concentrations of 200micromolar or higher can safely be ignored for therapeutic relevance. 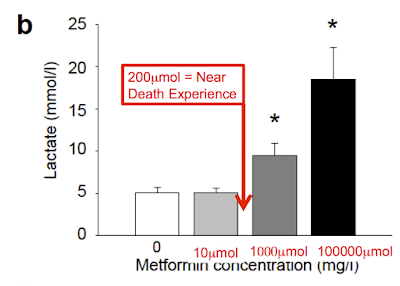 Except for the confirmation that cells die rather well at 1.0mmol of metformin and are doing rather more apoptosis than you might like at 200micromolar (see Figure 3 in the paper). No surprises there. Also consider that picking up subtleties of insulin secretion by measuring the concentration in a culture well is a very blunt instrument. But at least they are looking. So why doesn't metformin cause diabetes on the sort of criminal (up until very recently) diet advised by any diabetologist? This is partly because the redox changes in the liver suppress gluconeogenesis, though the exact mechanism by which blockade of mtG3Pdh suppresses hepatic glucose production is debatable. 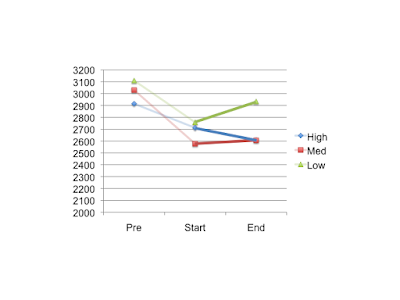 It's also because, certainly in peripheral cells suffering from chronic hyperinsulinaemia-induced lipotoxicity, cessation or reduction of insulin signalling will allow release of fatty acids able to generate their own RET via the oxidation of beta oxidation derived electron transporting flavoprotein at mtETFdh of the electron transport chain and so restore insulin signalling. Or, if there is enough superoxide, insulin resistance. So cells suddenly realise they have a great supply of FFAs, adequate ATP generation and no need for any more caloric ingress. Which generalises to the whole organism as a "no need to eat" state, which might just give weight loss. As metformin does. Kind of like LC eating in a pill. 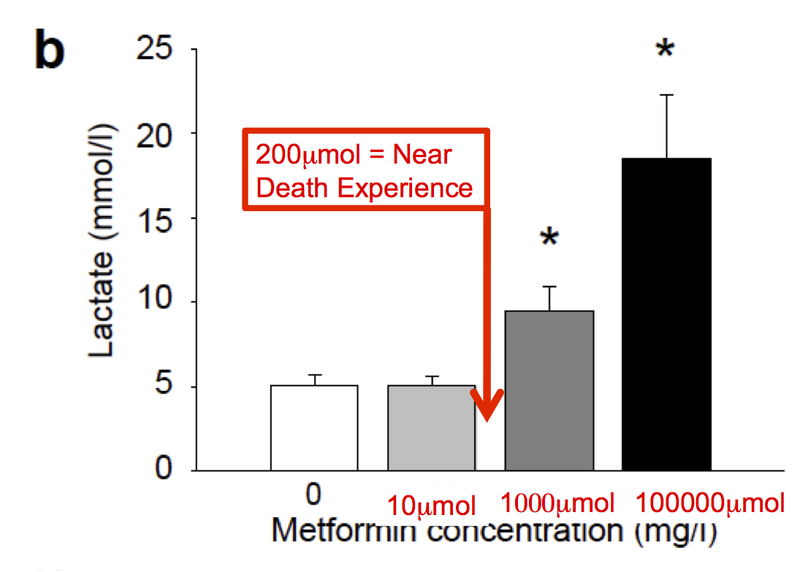 Actually metformin might do the same to lipid in the pancreas as it does in peripheral tissues. Loss of accumulated pancreatic lipid is what people like Dr Roy Taylor consider the mechanism by which the hypoinsulinaemia of semi-starvation induces some degree of remission of diabetes, in a few patients, while they can stick to it. When you follow this input back you end up with the one factor which suppresses AMPK signalling. 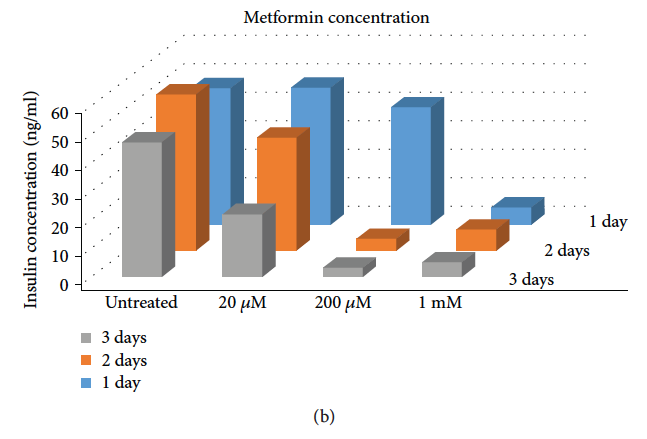 Of course metformin inhibits complex I (which drops ATP and so activates AMPK) at concentrations which put you in to the ITU with lactic acidosis, around 200micromolar in plasma. Recall this? It also activates AMPK via inhibition of AMP-deaminase using tissue culture exposure of 10mmolar. That's 10,000micromolar, which would probably put you in to the morgue rather than the ITU. A quick reality check suggests that taking one 500mg metformin tablet an hour before a bike race might just help you win... Somehow I don't think blockade of complex I would do that! Freeing up fatty acids by dumping insulin signalling might just do the job. TLDR: The action of insulin is the inhibition of lipolysis. CSF insulin hits 25pmol/l. There is no penetration in to the systemic circulation. My feeling is that a rise from a basal CSF insulin of 7.0pmol/l to a peak of 25pmol/l, ie just over a tripling of fasting levels, probably reflects what might well be a physiological post-prandial concentration change within the brain. Roughly. Note that intranasal insulin enters the brain at a clearly detectable concentration within ten minutes. What was the effect of the first dose of intra-nasal insulin? Or, rather, from the first 28 doses? Not a lot, judging by the weight change in the first week. Or the second week. Or the third week. That's 84 doses of intranasal insulin over three weeks. 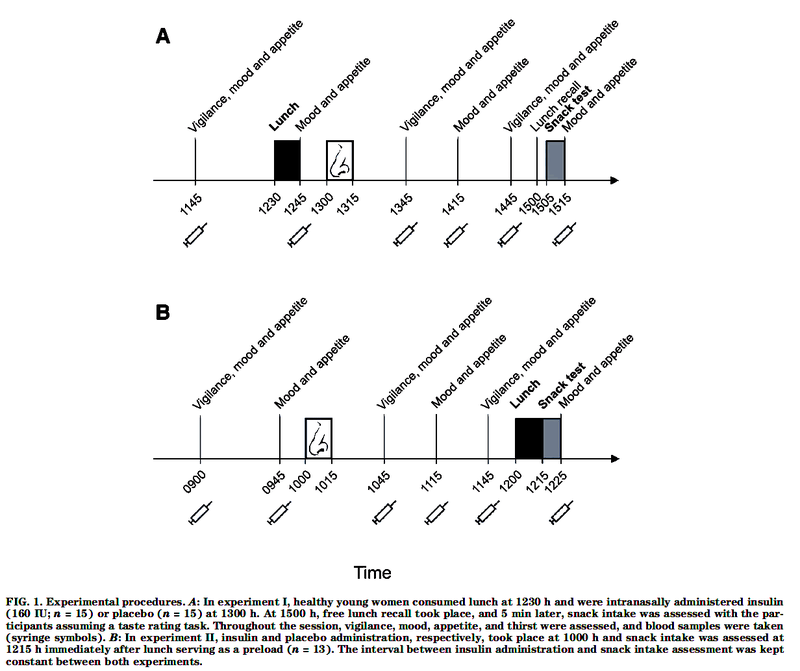 Recall 40iu of intranasal insulin triples CSF insulin concentration within ten minutes. No weight loss over three weeks. 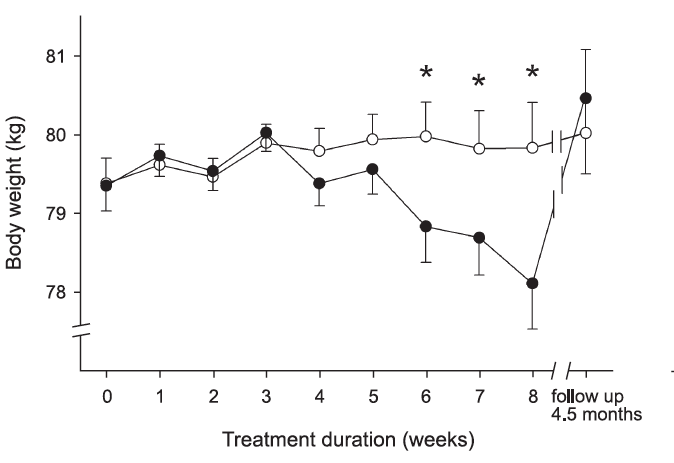 Does anyone else see a trend for weight gain in the treatment arm (filled circles) over the first three weeks or is that just my confirmation bias over riding my visual acuity? Anyway. For three weeks, that's 84 doses of 40iu intranasal insulin, there is zero weight loss. Nil. Zilch. Nadder. If anything there is a minuscule trend upwards. And I mean minuscule. Then by week four something marvellous happens and consistent weight loss ensues. So the question is: How many 40iu intranasal doses of insulin does it take to induced VMH insulin resistance in young healthy men? Sadly the answer is not 42, this is merely the answer to Life, the Universe and Everything. It's actually twice that, 84. It seems that it takes more like 84 CNS over-exposures to insulin to obtund its lipolysis inhibiting effect normally induced via the VMH. At this point nutrients are less effectively sequestered in to adipocytes and so become more available for metabolism, obtunding hunger and allowing weight loss. 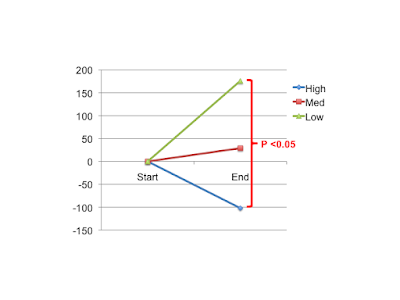 If anyone has a better explanation for the shape of the weight loss graph I'd be interested to hear it. The authors don't. OK. I published the "awaiting moderation" comments. Lots of them are insightful and need a response. Time for this is not looking good at the moment! The main upset is that I mis-clicked delete instead of publish on a comment by Nicolás Flamel which I can't find any way of recovering. Sorry for that. Please feel free to re comment if you wish. TLDR: The function of insulin is the inhibition of lipolysis. 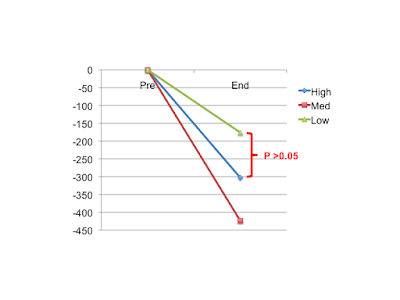 Does resisting insulin facilitate lipolysis? Aside: Oooooh, look. No control group! How can I already tell they are going to find that insulin suppresses appetite? 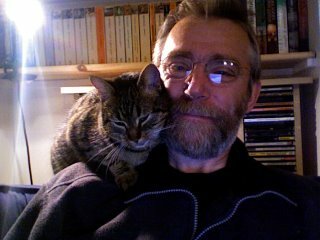 End aside, sniggering excepted. The only parts I am interested in are the clamps and the appetite scores (no food intakes in this one). So anyway, there we have it. 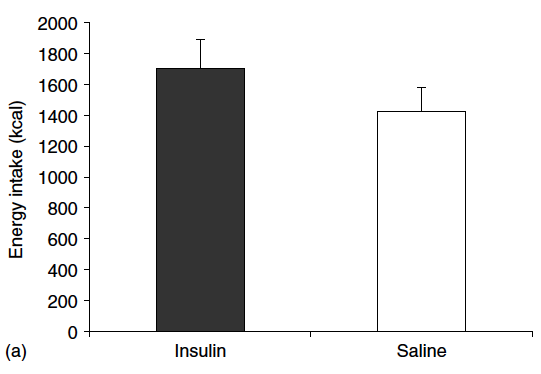 Insulin, entering the brain by the physiological route, suppresses appetite in real live humans with a dose response. Time to shut up shop and go back to kayaking in my free time. But just one moment. I think it might be worth looking at this study in the units of insulin concentration that we are most used to working with. I used this website to do the conversions. We have here a fasting insulin somewhere around 40-50pmol/l. In old money that is 6.0microU/ml, quite reasonable. The low clamp is around 900pmol/l, just over 130microU/ml. 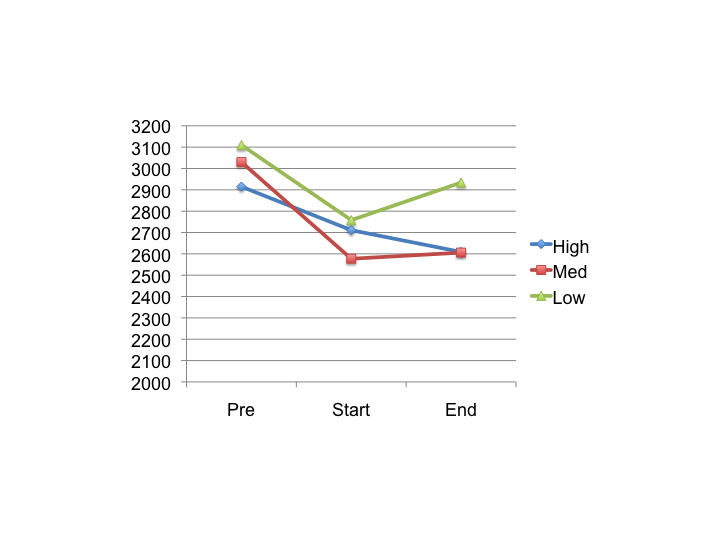 This is pretty well "normal" for physiological post prandial insulin after eating a meal of junk. 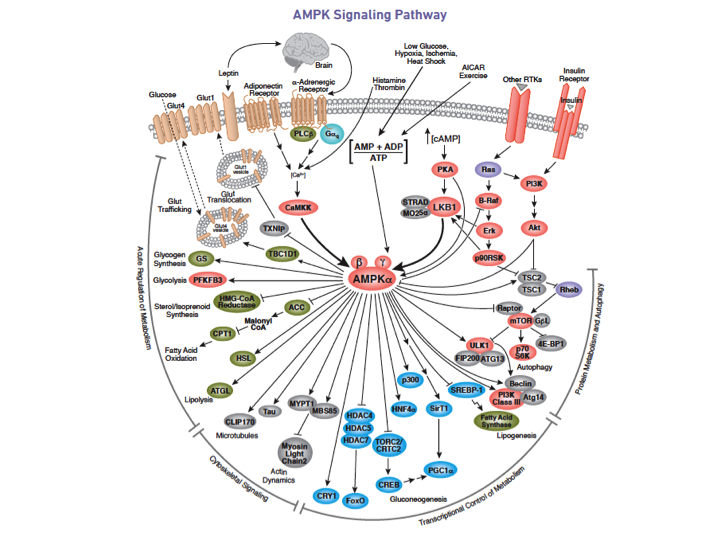 Now, here is a sideways way of looking at CNS insulin. If the physiological role of insulin in the VMH is to augment fat storage, what might be the effect of CNS insulin resistance? Go on. 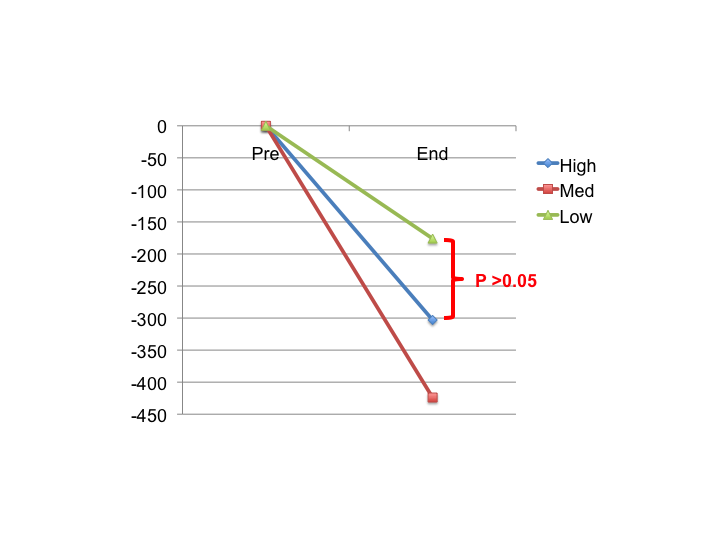 I dare you to say that the effect might be partial failure to suppress lipolysis, less suppression of FFAs and so reduced appetite augmentation. Resisting insulin allows you to resist its hunger generating effects. How's that for a bizarre idea? Feel free to point out faults in the logic. I've long been interested in the concept that exposure to insulin itself induces insulin resistance. There are a whole slew of papers to suggest this, some better than others. Overall I find the concept quite convincing. 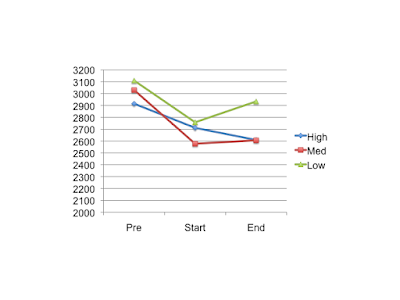 If we convert the nanomolar concnetration from cell culture to the picomoles of in-vivo clamps then the two higher concentrations used in this graph would be 17,000pmol and 170,000pmol, similar to those from the high dose clamp used in the human study. 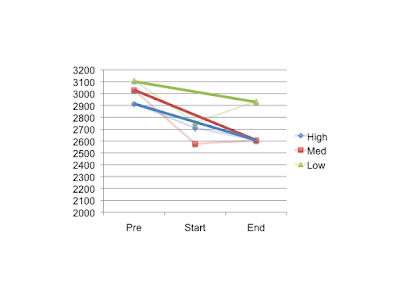 Especially when you consider that 17,000pmol and 170,000pmol have indistinguishable effects on IR phosphorylation (and acute generation of resistance to that phosphorylation effect) in cell culture. 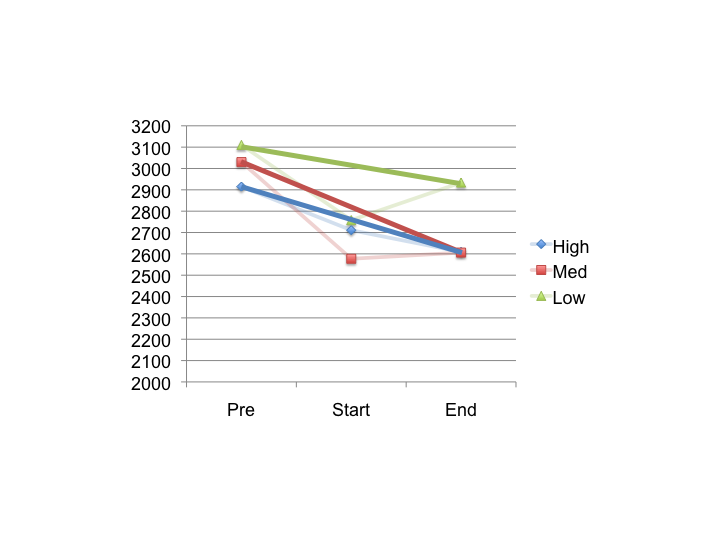 So it seems quite feasible to me that a physiological clamp at 900pmol/l would produce normal "insulin hunger" due to lipolysis suppression and that a clamp at 30,000pmol/l would induce significant insulin resistance. 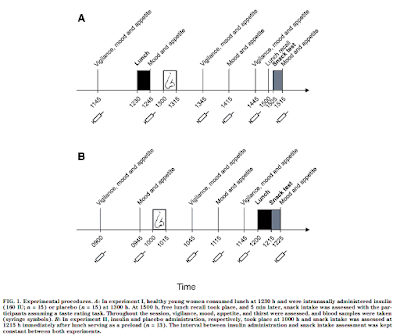 That limitation on insulin signalling would obtund the normal inhibition of lipolysis (but not eliminate it entirely) and so defer the normal onset of hunger routinely induced by the physiological action of insulin. So very large doses of insulin (170,000pmol in cell culture imitating 30,000pmol/l as a clamp) should postpone the onset of hunger compared to mildly supra-physiological doses (5000pmol in culture imitating 900pmol/l as a clamp) because the higher doses should cause less inhibition of lipolysis, with the proviso that you choose your target concentration very carefully. Obviously no one does a study without a pilot trial to make sure they will get the results they want. 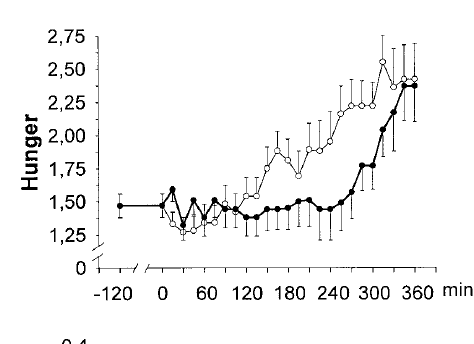 A saline infusion produces no significant increase in hunger over 150 minutes, though the trend in hunger is upwards because supper was a long time ago by the end of that particular study! I'll take a pause here because I think this current concept is quite controversial enough to be stated as simply as possible. Obviously there are more studies which we can look at to explore the usefulness of this idea. For a level deeper of understanding you just need to add in that saturated fats have an FADH2:NADH ratio around 0.49 which is the physiological signal for insulin resistance and MUFA generate one of around 0.47, giving the signal for insulin sensitivity. This is physiology. 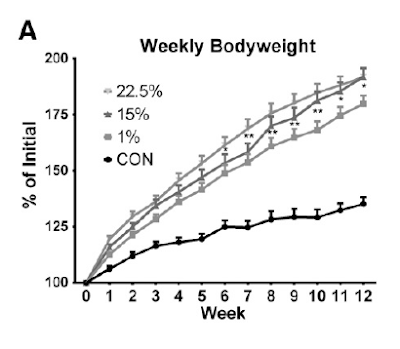 Adding in PUFA as a bulk calorie source, with an insulin hyper-sensitivity generating FADH2:NADH ratio of well below 0.47, leads to expanded adipocytes. This is pathology. 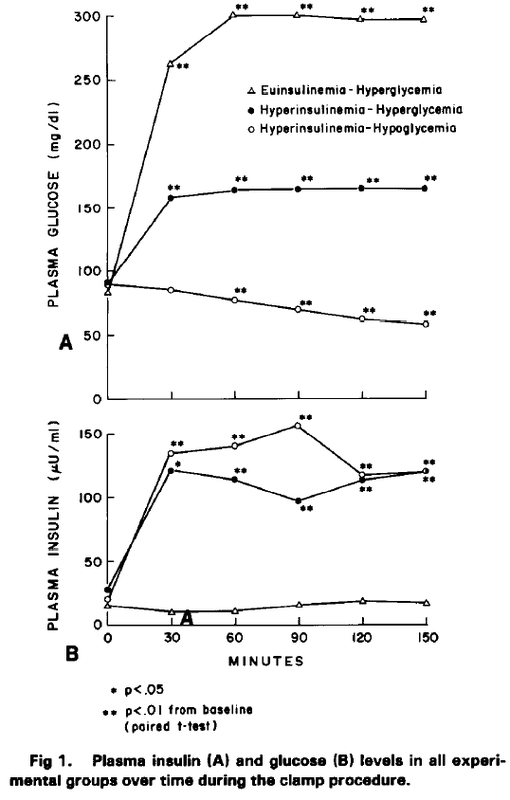 Because a core function of insulin is the inhibition of lipolysis.